The Weslaco City Commission will stay the same — for now. Weslaco voters re-elected District 4 Commissioner Jerry Tafolla to a fourth term, according to unofficial results. Tafolla, an employee of Hidalgo County Precinct 1, received about 56 percent of the vote, 710 votes. Challenger Lupe Garcia, the city’s former parks director and current Weslaco Independent School District transportation director, received 556 votes, about 44 percent of 1,266 ballots cast. “Weslaco is the place to be. 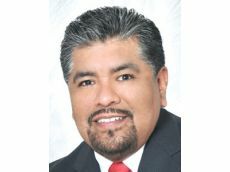 It’s the center of the Valley and will continue to grow in big margins, and I will continue to serve the entire city of Weslaco as a commissioner of district 4,” Tafolla said. Though drainage emerged as a priority for the commission following a flood in June, a federal grand jury issued a subpoena in March, demanding the city turn over conflict disclosure statements submitted by former and current city of Weslaco commissioners, mayors, employees and vendors dating back to Jan. 1, 2009. Tafolla, first elected that year, has refused to address the subpoena or rumors of a federal investigation targeting the city’s water plant project. He deferred comment to the city’s attorney. In 2011, the commission approved a no-bid contract with San Antonio-based Briones Engineering to expand the city’s water plant to meet water demands. Tafolla, the only current commissioner serving that year, survived a power shift. He previously said he could not speak about the potential investigation and declined to comment about it Wednesday morning. Residents in Weslaco continue paying higher-than-average water rates to cover the cost of the project. The city settled a lawsuit with Rolando Briones, the water plant engineer, who designed the project, working alongside construction manager at-risk CDM Constructors. Though Tafolla has been reluctant to talk about the federal subpoena, others on the commission have spoken freely about it, going as far as welcoming an investigation. Tafolla previously said job creation and updating the “antiquated drainage system” were the top concerns among voters in his district, some who were flooded in June, when a substantial amount of rain flooded the area and affected about 25 percent of residents. “Most of all, I’d like to hit the ground running with the drainage to see how it is that we can improve the system,” he said, noting he also wants a park in the northern part of the city. Commissioner Leo Muñoz ran unopposed for his District 1 seat. Then-City Secretary Elizabeth Walker, serving as Weslaco’s elections administrator, notified challenger Dina Murillo that her name would not appear on the ballot due to state law requiring candidates register to vote in the “territory elected” from by the filing deadline, Aug. 26. Murillo’s voter registration was not active within the district until about three weeks after the deadline, resulting in her disqualification. Julie Ann Valdez, who also filed for the seat, withdrew her application in time to remove her name from the ballot. Muñoz will serve a second term.